For the first time since 2011, the Dodgers are champions of the Arizona League. 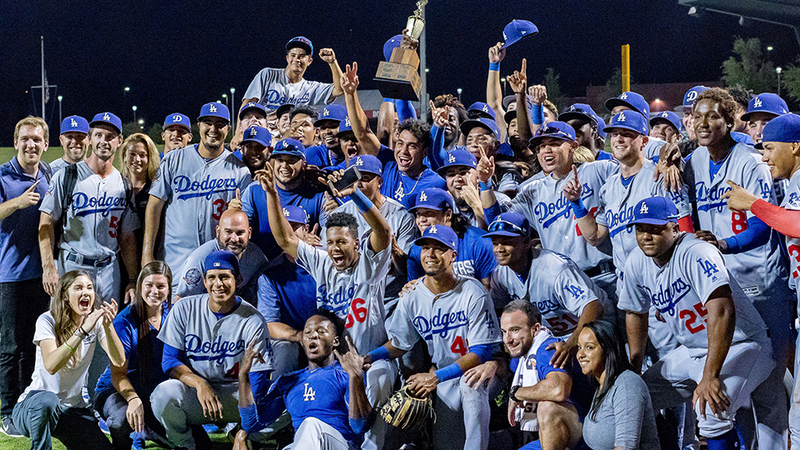 Sauryn Lao delivered a two-run triple in a four-run fifth inning that lifted the Dodgers to a 6-5 victory over the Cubs at Sloan Park in the decisive third game of the AZL Championship Series. "We have an amazing staff, top to bottom, in our AZL operations," Dodgers manager Mark Kertenian said. "Our coaches worked their tails off and I'm speaking on behalf of them. This was a total team effort." It's the second straight championship for second-year manager Kertenian, who guided Rookie-level Odgen to the Pioneer League crown last season. "This is an organizational win, as last year was as well," said Kertenian, who was an assistant coach at Florida International University, the University of Nevada and Cal State Northridge before entering the pro ranks. "There are a lot of amazing people involved every day, from scouting all through the organization." The Dodgers overcame an early 3-0 deficit, scoring four times in the fifth. Leonel Valera singled home Aldo Espinoza and Lao raced home on a wild pitch by Chi-Feng Lee. Aldrich De Jongh, who singled twice and drove in a run, said Lao was a big influence on the team all year. "Lao is a great person, great player. He was always picking us up," the 20-year-old outfielder from Curacao said. "He was always telling us, 'Just play hard, you'll make plays.'" The Cubs, who squared the series on Friday behind Didier Vargas , jumped out to a 3-0 lead in the first in the deciding game. Edmond Americaan walked and Dalton Hurd was hit by a pitch by starter Jacob Gilliland. A walk to Yonathan Perlaza loaded the bases and ended Gilliland's night, but Alexander Guerra greeted Edward Cuello with a three-run double. The Dodgers cut the deficit to 3-1 in the third when Sam McWilliams lined a single to left to score Espinoza, who drew a leadoff walk. The Cubs threatened in the seventh as Franklin Tineo led off with a single and moved up on a wild pitch by Ricardo Hernandez, who struck out Rafael Mejia and got Americaan to line into a double play. The Dodgers added a key insurance run in the eighth as Jeremiah Vinson reached on an infield hit, took second on shortstop Josue Huma's error and scored on De Jongh's single to right. The Cubs nearly thwarted the Dodgers' celebration in a wild ninth. Facing Nelfri Contreras, Huma single and took second on a passed ball. A pop fly single by Orian Nunez put runners on the corners and Ezequiel Pagan singled home Huma with one out. A balk put two runners in scoring position and a wild pitch by Nathan Witt produced a run with two outs. With the tying run at third, Hurd flied to center and the Dodgers stormed the field. Antonio Hernandez (1-0) pitched two scoreless innings for the win, while Cubs starter Jesus Tejada (0-1) surrendered four runs -- one earned -- on four hits in 4 2/3 innings. Kertenian said his second title was just as good as the first. "They're equally amazing. We're just lucky to be around these hard-working people," he said. "But the value in every day is the most important part of being a pro in baseball, win or lose. It's not only about achieving in the moment, it's about building relationships. Yes, we did win a championship, but the most important part is what they learn about pro ball." Although Kertenian has won the ultimate prize in both of his years in pro ball, he instilled in his players that it doesn't come that easy. "Yes, I appreciate many guys don't have a chance to win a title in their first year," said de Jongh, a 17th-round pick in this year's Draft out of a Florida high school. "But I have teammates that are always ready to go, and we played hard."